The 2015 Junior Nationals includes exciting head-to-head elimination racing on a 1.5-kilometer course at Auburn Ski Club. DONNER SUMMIT, Calif. — The US Ski and Snowboard Association has awarded Auburn Ski Club the 2015 USSA Cross-Country Skiing Junior National Championships, officials announced Saturday. 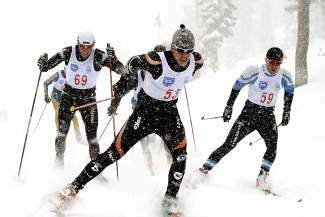 The annual event brings more than 400 of the nation’s best cross-country skiers, ages 13-19, for a week of competition on the challenging ASC Training Center courses. During March 8-14, 2015, there will be four separate competitions in both classic and freestyle disciplines, according to an ASC press release, with more than 750 spectators, coaches and parents from out of the area attending. On March 29, 2014, from 3-5 p.m., the ASC Training Center, located next to Boreal Mountain Resort, will host a presentation; ASC members and the Nordic community are invited to learn about the event and volunteering and sponsorship opportunities. Individuals interested in volunteering can sign up at http://xcjuniornationals2015.com/volunteer-sign-up/. Learn more about Auburn Ski Club Training Center at auburnskiclub.com.